The “omics” revolution and the systems biology approach are fundamentally reshaping thought about the human body. Microbiome specialists now regard the epithelial surfaces of body (skin, oral and gastrointestinal, respiratory, and reproductive tract) as an interconnected network of ecosystem harboring all three domains of life, the eukarya, the prokarya, and the archaea. The gut microbiome is now regarded as a virtual organ. It is unique among organs as it is composed of hundreds of species and thousands of strains of prokaryotes and their viruses. The Human Genome Project is only part of the metagenome that comprises the human ecosystem. Indeed, work on the “second human genome” has been undertaken by the Human Microbiome Project (HMP) in the United States, and by Metagenomics of the Human Intestinal Tract (MetaHIT) in Europe. A major goal of much of this research is to understand the structure and function of the gut microbiome, and how diet, antibiotics, and pharmaceuticals perturb it. These studies also aim to uncover fundamental host-microbe interactions. 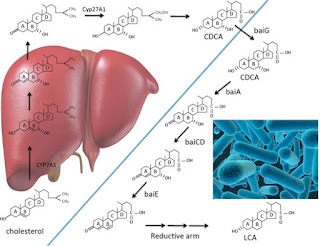 Research over the past several decades highlights the expanding role of bile acids (BAs) as hormones regulating lipid, glucose, lipoprotein, energy metabolism in addition to inflammatory responses. BAs are also known to fundamentally shape the gut microbiome and vice versa. We will argue here that our gut microbiome should now be thought of as an “endocrine organ” and we will focus on BAs, although this concept applies to many other classes of molecules including catecholamines, short-chain fatty acids, amino acids (GABA, γ-aminobutyric acid) and steroid hormones. The gut microbiome is thus an organ capable of producing a cocktail of BA hormones that affect the composition and function of the gut microbiome, and interact with cells of the gastrointestinal tract during the enterohepatic circulation, in addition to distant targets including heart, kidney and even adipose tissue (Fig. 2). Further elucidating the gut microbial genes involved in BA and other steroid hormones introduced in the gut by both endogenous and exogenous (diet and pharmaceuticals) is an important research direction simply because by this capacity, the gut microbiome is an endocrine organ. We propose the term “sterolbiome” to describe the repertoire of human gut microbiome genes involved in the uptake and metabolism of host, pharmaceutical and diet derived steroids. The BA composition observed in mammals is the result of equilibria between enzymes encoded in the mammalian genome, and the gut sterolbiome. BAs are now viewed as hormones with both hepatic and extra-hepatic effects ranging from inflammation to glucose and lipid homeostasis. Given that microbial secondary BAs activate the nuclear receptors that recognize host primary BAs, the gut sterolbiome represents an important class of enzyme encoding genes that give gut microbiome the ability to act as an endocrine organ with far-reaching effects in the host. Perturbing effects of the sterolbiome, such as diet, antibiotics, probiotics, and so forth, have the potential to affect many physiological effects that result from the composition of the BA pool. A major current goal of BA-sterolbiome research is identifying members of the gut microbiome that encode sterolbiome genes, and characterizing microbial BA metabolizing gene products and the metabolites that induce their expression. Future research will seek to build models to predict the pattern of BAs when certain sterolbiome members and metabolites are present in the gut, and the physiological effects on the host. A significant potential exists with the current therapeutic BA UDCA used for treating several disorders of the liver and GI tract. 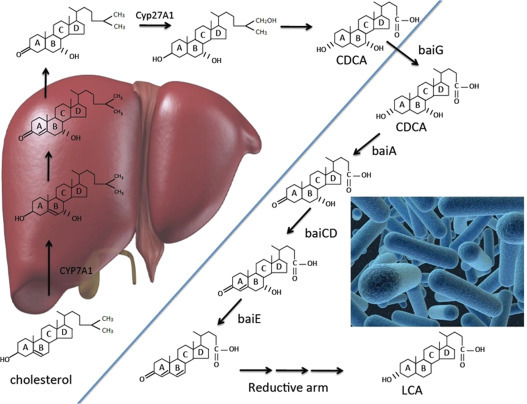 Our hypothesis, consistent with the current literature and opinions in the field is that by targeting the microbiota capable of producing DCA, and inhibiting the microbial conversion of UDCA to LCA, UDCA will be shown to be a more effective therapy. Specific inhibitors against the BA 7α-dehydroxylating pathway, which eliminate secondary BA productions, would provide further advances in understanding how a shift in BA pool composition impacts both host physiology, as well as microbiome structure-function. Thanks to all the visitors! And Happy New Year!